Something quite magical happened when Laurel & Hardy came to Ireland in September, 1953 – as they pulled into the port of Cobh in County Cork, the following happened…. Céad Míle Fáilte – and you are most welcome to your Letter from Ireland for this week. Well, Christmas is well and truly in the rear view mirror as we move into the start of a new year. The weather is “fair to middling” in most parts of Ireland – with a mildness that belies the time of year. We noticed the first snowdrops just the other day – a sight that gladdens the heart! I’m having a cup of Barry’s tea as we chat – so I hope you’ll have a cup of whatever you fancy, and join me for today’s Letter. 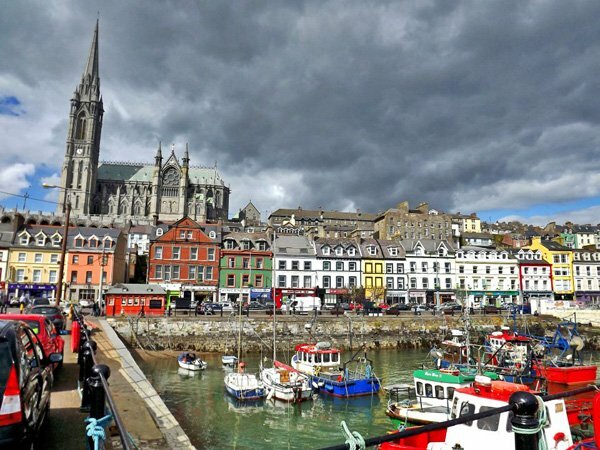 Let’s start by chatting about one of the most-visited landmarks in Ireland – Saint Colman’s Cathedral in the pretty port town of Cobh in County Cork. Maybe one of your ancestors departed from this port (also known as Queenstown) as they left Ireland to start a new life in a new world? The construction of Saint Colman’s Cathedral began in 1867 and was finally consecrated in 1915. One of the most notable features (there are many) of the building is the “carillon” with 49 bells in the tower – one of the largest in Europe. Today, the bells ring automatically on the hour as well as for Masses, funerals and weddings. However, the carillon is a keyboard-type instrument and the attached bells can also be played on special occasions by the current carillonneur – Adrian Gebruers – as it was by his father, Staf Gebruers, before him. On September the 9th, 1953, the S.S. America pulled into the port of Cobh following an Atlantic crossing from New York. Cobh was the final destination for quite a number of the passengers – but two gentlemen in particular excited the imagination of the youngsters of the town of Cobh. You see, word had leaked out that Stan Laurel and Oliver Hardy – of the comic duo “Laurel and Hardy” fame were due in Cobh on that very same boat. The high-water mark of Laurel and Hardy’s movie career was well behind them at this point. Their families needed the money – and they were still famous in Europe in a way that had faded back in the USA – so they embarked on a music-hall tour of Ireland and the UK to reach those adoring audiences directly. They had left New York with little fanfare and expected much of the same on their arrival in Cobh. How wrong they were. “The docks were swarming with many hundreds of people. ‘It’s strange, a strange thing, our popularity has lasted so long. Our last good pictures were made in the thirties, and you’d think people would forget, but they don’t. The love and affection we found that day at Cobh was simply unbelievable. There were hundreds of boats blowing whistles and mobs and mobs of people screaming on the docks. We just couldn’t understand what it was all about. And then something happened that I can never forget. All the church bells in Cobh started to ring out our theme song, and Babe looked at me, and we cried. Maybe people loved us and our pictures because we put so much love in them. I don’t know. I’ll never forget that day. Never”. So, the bells of Saint Colman’s cathedral rang out in style on that day to the delight of those hundreds of Irish children – and much to the delight of two middle-aged comedians who brought joy and happiness to so many around the world. Stan and Ollie made their way to the cathedral to thank Staf Gebruers in person. His son, Adrian Gebruers, was one of those children on the day. He later recalled the day in full in this lovely account. How about you? Are you a fan of Laurel and Hardy – maybe you’ve even seen them “in the flesh”? Do leave a comment below and let me know.